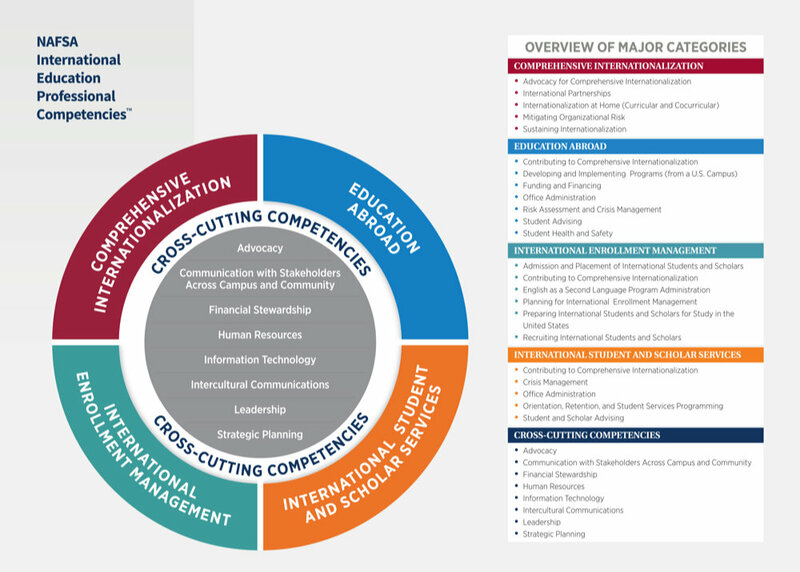 Created by a group of NAFSA member leaders and reviewed by numerous international education experts, the NAFSA International Education Professional Competencies™ forms the basic building blocks of the international education profession. This inventory is intended to define the professional knowledge, skills, and abilities expected of international education professionals working in the United States, regardless of their area of specialization or role within the field. From adviser to manager to policy maker, the International Education Professional Competencies offer everyone working in international education a direction for professional success. NAFSA is pleased to introduce Career Print, an online self-assessment platform grounded in NAFSA’s International Education Professional Competencies™ that identifies areas for individual growth and professional development. Career Print brings the International Education Professional Competencies™ into a new, interactive online assessment that allows individuals and teams to calibrate their skills and knowledge. By completing the online assessment, users can identify areas for individual growth and, upon completion of the assessment, are provided a list of professional development opportunities and resources. 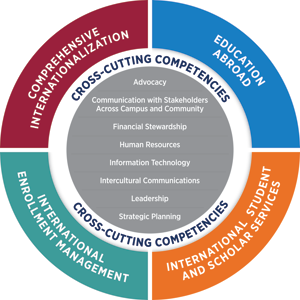 The International Education Professional Competencies™ is organized into four key professional practice areas—Comprehensive Internationalization, Education Abroad, International Enrollment Management, and International Student and Scholar Services—as well as cross-cutting competencies, which describe the shared skills and knowledge needed across all international education domains. The competency statements are also divided into “Responsibilities” and “Knowledge,” with “Responsibilities” referring to the skills required as part of the function or role and “Knowledge” referring to the knowledge needed to accomplish the responsibilities listed in the corresponding category. Create new content that benefits the field. Download a copy of Hiring Manager Questions: In Alignment with the NAFSA International Education Professional Competencies™. Use a tool when hiring employees in the areas of education abroad, international enrollment management, and international student and scholar services.